Juiced is the only racing simulation that totally immerses you in the lifestyle and culture of the real street modding scene that has the gamer starting as the new kid on the block. 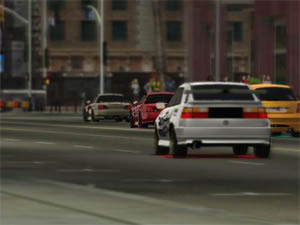 As you progress through the game, you soon build up your own crew of driving champions with the aim of dominating the street racing scene of Angel City. 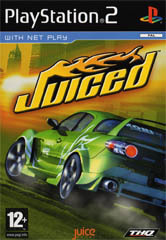 Ironically, Juiced has been in development for quite some but when publishing giant Acclaim went bankrupt, THQ soon scored the rights to this interesting racing game. This delay in the release has unfortunately caused the game to be slightly dated with other similar games on the market at the moment but that's not to say that Juiced is a bad game. Juiced contains a variety of different gameplay modes with the career mode being the prevalent form of play. The game allows gamers to perform a plethora of in game options from buying new cars, betting on races and more importantly, earning respect. Although the gamer does begin with a car, they must slowly work their way up in the racing world by earning cash and trying not to damage their car, because it's not free to repair the damage. 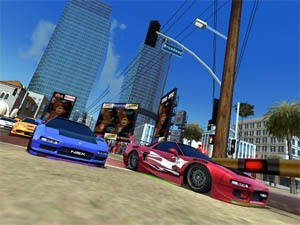 The gameplay mode of Juiced features the traditional racing style of gaming that has the gamer going from point A to point B. The developers have even added some team racing events which allows you to race against members of your team and by winning races, you not only win cash but also your prowess as a racer. Aside from racing, there is also a style competition that gives you additional points for performing tricks such as 360s, speed trials and burnouts. Although Juiced boasts as a racing simulation game, it is in actual fact an arcade racing game that features responsive controls that makes full use of the dualshock controller. Graphically, Juiced is an impressive title on the PlayStation 2 that features some extraordinary car models with reflective surfaces and high resolution textures that almost look like you are watching the television. Even though the background environments are lush with detail, they unfortunately become repetitive because in many stages, it's almost as if you are racing around the same tracks that you just raced on. With that said, Juiced maintains an exceptional framerate on the PlayStation 2 that should not be scoffed at. The soundtrack of Juiced is brilliant and features artists like Xzibit and Dub Pistols found in the lineup of other unknowns. The sound effects of the game unfortunately sounds a little forced and generic but fortunately voice acting makes up for the lack of realistic sound effects. In conclusion, Juiced is an above average game that features some decent gameplay and some entertaining graphics and music. Unfortunately Juiced is a little too late and really can't compare with games such as Midnight Club and Need for Speed Underground but if you can't go without a street racing game then check this one out.